California remains to be a place which attracts people to move to and try a local approach to life. The population of the ten biggest Californian cities grows every year, but the fastest one is Sacramento. If you are planning on moving to Sacramento, you should know what kind of benefits you can get from resettling here. To learn what’s it like living in Sacramento we will take a deep survey in cities’ advantages and its weak sides. Today Sacramento has a population of 501, 896 people and 170 neighborhoods. The city of Sacramento, like most of the big cities in California, is a very diverse one – many ethnical groups and races find a home here. It is important to note that more than 20% of residents in Sacramento were born in another country. California is one of these dreamy destinations for young people. Every year we observe how the percentage of people who move to California constantly growing. For example, in Sacramento, the population grew by a little bit more than 1,4 percent from July 2017 until now. In other words, during two years the population increased by more than 7,000 of people. The climate conditions always a significant factor for those who want to move to a new place. The weather in California generally is almost perfect – a few weeks with rains, no snow at all, and perpetual sunshine is something you have to expect. Sacramento has mild winters and hot summers. Proximity to the sea makes the air cooler and the temperature feels lower. The start of the summer is always very hot – average temperature in July is 75 degrees. December, on the other hand, is the coldest month of the year – 45 degrees. According to Köppen climate classification, Sacramento has a hot-summer Mediterranean climate. Let’s start with the fact that Sacramento is a capital city of California. The city is located in Northern California’s Sacramento Valley, where two big rivers meet – Sacramento river and American river. Sacramento is 90 miles from the Bay Area – less than 2 hours drive by the car. Such a location creates a good option for people who want to move to Sacramento from the Bay Area, which is relatively more expansive. In addition, the proximity to Napa Valley and Lake Tahoe open up a possibility to have a great vacation. Plus, Sacramento has a low risk of the earthquake. The city of Sacramento has a great art scene. There are dozens of art galleries in the city and neighborhoods. A special event, called “2nd Saturday art walk” begins every second week of the month at 5:30pm. until 9pm. or even later. It includes different shows like art exhibitions, street food, music and special events for each month. But the art itself in traditional meaning of the word doesn’t limit 2nd Saturday art walk. Restaurants, all kinds of boutiques and even shops share this evening too. What differs Sacramento city from Los Angeles or San Francisco is the way people here create their attitude toward personal style in clothing. The street style is quite casual. You don’t have to waste your money on exquisite fashion decisions here. It is almost goes without saying that you will find here plenty of cuisines to try. Since Sacramento is a home for the people not only from different parts of the United States but also from all over the world, there are the most fascinating food traditions too. Residents can always find something exceptional to put in a plate with local farm fresh food. You won’t have a lack of dining places, as well as places with beer and wines. In fact, at the beginning of its existence, Sacramento was widely known as a beer city. Today the presents of Napa Valley, Amador foothills and Delta regions bring out another great side of Sacramento – its amazing wines. Besides that, Sacramento has a few very good farmers’ markets. According to the American Economic statistics, Sacramento has one of the highest rates of employment in California. In fact, the city today considered as a good tech destination. Some companies from the Bay Area create offices in Sacramento, which also had a good influence on the employment rate in the city. It is important to mention that Sacramento has a very special reward: in 2015 Forbes magazine honored Sacramento as one of the happiest city to work in. Of course, Sacramento not that rich in entertainment facilities as San Francisco, but it still has vivid cultural life with many events. Nightlife mostly represented by clubs where people can dance, listen to favorite musicians or watch movies. You can reach lounges, live shows and other late time places. Among the best ones are The Park Ultra Lounge, The Torch Club, The Depot and Comedy Sportz. As it was mentioned before, there are many wine bars and brewpubs – all of them, of course, work at nights. Music scene is also well-presented at nighttime. A number of rock bands with world-famous reputation started its way in the Sacramento area. Annually the city serves as a host for the Sacramento Music Awards. There are plenty of airports in very close proximity to Sacramento. For example, Santa Rosa, Oakland, Modesto, San Francisco. All of these airports located less than 100 miles from Sacramento. Not every resident in San Francisco chooses to move through the city by car. It seems like a convenient option, but that does not fully justify one’s hope to move quicker. However, pretty good public transportation is helpful. Sacramento Regional Transit covers all the Sacramento area daily. You can use either bus or train, depending on your route. The cheapest option is to use Yolo Bus. In case you prefer to use only a railroad connection, there is a fascinating option for you – Amtrak train. It is a company with a long history behind it. The important part of the transportation system in Sacramento is RT Bus. There are 270 buses with more than 3 000 bus stops. Sacramento’s scenery is a real pleasure for the eye – it includes both natural landscape and cityscape. It won’t be a hardship to find a distinctive architectural building – they are practically everywhere. You can see Victorian mansions from the 19th century, plenty of architectural styles from the last century and modern skyscrapers. For the city’s visitors, there are museums walking tours, Sacramento churches and shopping walking tour. You should see places like Governor’s Mansion State Historic Park, The Sacramento Masonic Temple, Cathedral of the Blessed Sacrament and Tower bridge. The Sacramento City Unified District has more than 70 educational facilities which are spread all over the place. The highest rated colleges are California State College, Sacramento City College and Consumnes River College. There is also California State University in Sacramento – famous and celebrated education facility. The overall education level of people who live in Sacramento is generally higher than typical in the United States. More than 30% of adults in Sacramento have at least a bachelor’s degree, which is 10% more than average in the country. Sacramento has a lot of things to offer, and this long list includes a plenty of parks and recreation areas. But there is more: the residents are very fond of dogs so there are a few parks specially designed for dogs and their owners. However, you must acquire a dog license once you moving to Sacramento. Once you pass all the attractions designed rather for those who just visiting the city of Sacramento, you wanted to learn something deeper about this place. You will discover Sacramento from your bike and be sure you’ll find it amazing from such a position. Get used to great tastes of farmer markets and river camping – both are a real core of local life. In fact, the presence of rivers is giving you a great opportunity to have an extraordinary experience. There are a number of rafting companies which you may ask to arrange one of their services. Amazing local theatres – another way to immerse yourself into local life and experience something unique. The moment you get to know this city better you will feel amazing essence of the place. After all, you have a great option to explore every corner of beautiful Sacramento County – full of amazing nature, traditions and people. Every place has its strong and weak sides. Meanwhile Sacramento offers many benefits for its residents, California as a state still one of the most expansive places in the United States. Let’s take a look on some pros and cons of living in Sacramento. Despite the fact that Sacramento is cheaper in comparison to San Francisco, it is still very expensive to rent a place or studio. Today you can rent a one-bedroom apartment for $1,140, for two bedrooms it is $1,365. The price continues to increase over the last years. The average cost of living in Sacramento is at least 15 % higher than generally in the United States. Real estate prices in California have always been very high. Sacramento is not an exception – home price is still considering as very high here. The median home price in Sacramento is $322,000. 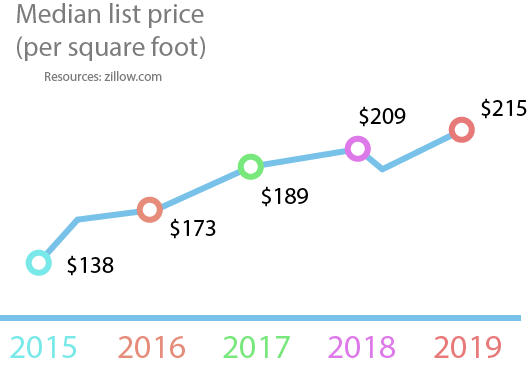 The average list price per square foot is $215. If you are planning on moving to Sacramento, you must be aware of the problem that suddenly can come out from nowhere. According to health American reports Sacramento one of the worst cities for allergies. The reason for that is pollen. It is highly recommended to kconsider it if you live in Sacramento and already have been experiencing allergy reaction. Some days there is a higher level of pollen than in the others. Homeless people is a common thing in all the big cities in California – in Sacramento as well as in San Francisco and Los Angeles. The problem with Sacramento is the lack of shelters for them. For the last few years, the government of the city is trying to solve this problem. Sacramento region has a growing traffic problem. Many people choose to use public transportation, and even that is still not really helpful. Today a lot of people decide to take a bike or a half walk – to minimize a traffic issue. In the last ten years, California has experienced unprecedented population growth. That fact influenced the population density in Sacramento – the city is becoming overpopulated. This is true for households – it is considered as overcrowded if there is more than one person per room. Humidity is a problem that can affect the condition of the house. The biggest influence humidity has on crawl spaces in the house. This weather condition arrives in summers when it is mostly hot. Both areas are great places for those who enjoy walking and bike riding. These neighborhoods areas earned the highest score of all cities areas. There is a great variety of dining places, coffee shops and unique architectural buildings. The low crime rate, good education facilities for children are in great access.Living in downtown Sacramento gives you a possibility to lead a safe, comfortable life. Both places have a great position which also affects a price. Midtown population is about 10 000 people, downtown – 7 000. Sacramento has unofficial nick name – The city of trees. One of the areas that completely justify the way people call the city is East Sacramento. It is a bunch of streets with an abundance of trees. It is a rather charming place with a population of 18 000 people. The neighborhood is famous generally because of McKinley Park, a heart of the East Sacramento area.A place nestled in close proximity to the downtown and midtown. This fact is also a great reason to move to East Sacramento. William Land Park is a reason why the whole neighborhood area called Land Park. The place consists of single family houses, popular theme parks for children (Funderland and Fairy Tale Town), Sacramento Zoo and the Park itself. Considering as a small, cozy neighborhood, very good for families with children. Median Home Value is $513,600, median rent is $1,411. Residents are mostly the owners of the houses. Boulevard Park is a neighborhood with a population of 4,380 residents. Considering as one of the best and safest places to live in Sacramento. Interesting fact about the place is that people here almost every time just rent a house instead of buying it. Boulevard Park has a lot of eating and drinking places, and vast recreational areas. It’s very good for young people who finished their study. If you come here with children, you must note that high schools are highly rated in this area. Median Home Value is $480, 213, median rent price is $916. Population density in Boulevard Park makes it rather urban. Tahoe Park has a population of almost 5 000 people. It is a 1-mile area that surrounds Tahoe park and consists of big family houses. Median Home Value is $274,936; meanwhile median rent is $1,288. This area is tending to be less safe than those we reviewed before. This is the area where you can get affordable living in Sacramento and it won’t affect the general conditions of the quality of life.You can also try living in West Sacramento – a great area with great job opportunities and nice surroundings. If you are moving to Sacramento there are some areas which you better to avoid. There are no good conditions for a safe life, proper medical treatment and high risk to become a victim of a crime. Rio Landa is a suburb area with a population of 15 000 people. Most of the residents are owners of the places where they live. Rio Landa has a high level of crime rate and not recommended to move to. Median home value still quite expensive – $223,700, as well as median rent price – $1,241. Another suburb area with a high crime rate and drug use is North Highlands. The population here is 47 000 people. The job opportunities are not good in this area, people mostly rent their homes. Median home value is much cheaper than in the other neighborhood and suburb areas – $168,300. Besides that, it is cheaper than generally in the United States ($184,700). Median rent price is $1,032. It is not very bad neighborhood according to some reviews. If you want to rent or buy a house here, which is by the way very cheap – $117,641 on avarage – you are still on high risk to be robbed. The American crime report has shown 2018 crime statistics- there are about 2000 burglary and theft crimes. This neighborhood area has a very high level of both violent and property crimes. 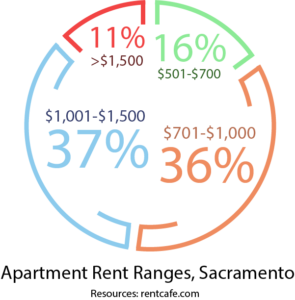 Median household income is $29,496, which is considering as low. Del Paso Heights is an urban area with a population of 5000 residents. The median home value here is $161,900, median rent price is $1,034. The biggest issue in this area is poverty. The level of security is quite low, which affects the possibility to be robbed or to be involved in a dangerous situation. Median home value is the same as general cost in the United States – $187,400. The same is about rent price – $1,059. Nevertheless, Florin has a great history behind it – the place found its beginning in the prewar time. Parkway is another area with the same issues – poverty, high crime rate and bad jobs. Parkway is a neighborhood located in elevation of 20 feet with a population of 22,134 people. There are a few good public schools, but families with children are not recommended to live here. As well as Parkway there are other similar areas in South Sacramento. This area has many reports on violent and property crimes. The problems with bad neighborhoods to live in are always the same and they were named before. If you are moving with children it would be better to find a neighborhood with good schools and a high level of security. Living in East Sacramento can be very cheap if to compare with other parts of the city, but the quality of the place and accessibility to something you might need immediately (like medical care) can be limited. To pack and move your personal goods in secure fashion hire a reliable moving company. If you want to move quickly and with great comfort, you can hire our California moving company. We will give an individual truck for your items and friendly, respectful team of professional movers and drivers. We have been performing all kinds of moving services – residential, office or even piano moving for many years. It will be our great pleasure to ensure you with a smooth move. We are always working with a strict schedule. You can be sure that our movers will arrive at your new address in Sacramento right at the time.